After the jump, I’ll share a bit about my history with comic books in order to contextualize my perspective. Then, in the not too distant future, I’ll offer a few thoughts about the comics on that list. So far I’ve read the Animal Man and Severed #1. Both are really good! 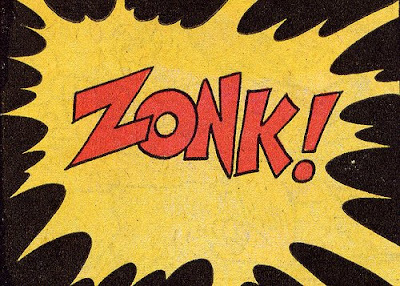 Truth is, I didn’t read comic books as a kid. I collected a few of them, but only for their exchange value. For the same reason, I collected baseball cards even though I never watched baseball and in fact loathed the sport. The first time I actually read a comic book I was in film school, around age 20 (so, nearly 15 years ago). One of my closest friends avidly devoured comics. Ritualistically, he went to the comic book shop on Maryland Parkway across from UNLV campus every Wednesday to purchase the latest offerings. Sometimes I would accompany him and peruse the titles, but mostly it didn’t interest me. At some point he encouraged me to read a Brian Michael Bendis series called JINX, which I remember enjoying, but not enough to become addicted. I read Scott Mccloud’s seminal Understanding Comics because at the time it was required reading for student filmmakers. Beyond that, I rarely even peeked at comic books. 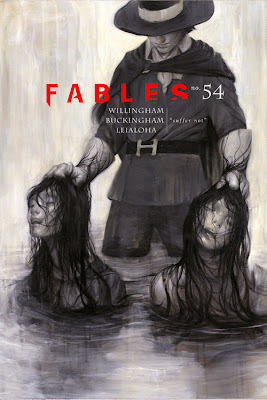 Then a few years ago my wife started reading this series called Fables, which is a sort of retelling or reimagining of classic fairy tales. One day, while I was at the comic book shop in Columbus OH, where we lived at the time, I noticed an interesting-looking cover for something called Y-The Last Man. The storekeeper informed me that the writer, Brian K. Vaughan, was also one of the writers for the television show LOST, which was at the time one of my favorite shows. Plus, I’m a sucker for “last man on earth” scenarios, so I grabbed it along with my wife’s copy of Fables. I read it and enjoyed it and got the second volume and read it and enjoyed it, but after that my enthusiasm waned. (As of today it looks like there are ~10 volumes, so I have some catching up to do!) My wife, on the other hand, has remained interested in Fables, and stays as up to date as she can on them. After my encounter with Y-The Last Man, I read a few others that I’ve really loved and would highly recommend. Charles Burns’s Black Hole, which is about these mutated teenagers in the 1970s who suffer from a hideously grotesque sexually transmitted disease. Hans Rickheit’s The Squirrel Machine, which bills itself as “AN ANACHRONISTIC PARABLE FOR THE CONVULSIVE ELITE.” Jim Woodring’s Portable Frank and Weathercraft, which are these nearly silent surrealist dreamscapes. Jason’s Almost Silent, which similarly eschews language but includes zombie vampire skeleton dog-like creatures and a healthy amount of humor. Josh Simmons’s Jessica Farm, which describes itself as “a Lynchian take on Alice in Wonderland.” Theo Ellsworth’s Capacity, which is like a Borgesian labyrinth of metfictional madness. Fletcher Hanks’s old school awesomeness You Shall Die By Your Own Evil Creation!, which seems to be considered by some a work of outsider art. Stan Lee & Steve Ditko’s Doctor Strange, which is mystical and occultish and fun. As well, I’ve become extremely interested in the horror, mystery, and sci-fi comics of the “pre-code” era, which is to say prior to 1954. (The code was a censorship program akin to the Hayes Code in cinema. You can read the original code here.) My favorite of these early comics that I have found so far were published by EC, with titles like: The Haunt of Fear, Tales From the Crypt, Shock SuspenStories, and Weird Fantasy. I scored a big stack of these EC titles from a badass comics shop called Secret Headquarters in Silverlake, the last time I was in Los Angeles. I’m sure there are other comics I’ve read and loved and would recommend, but at the moment they’re eluding me. 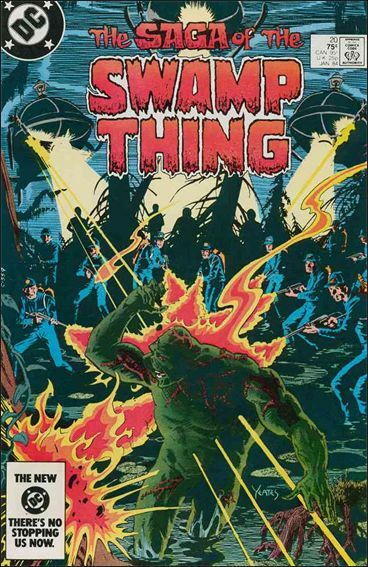 In addition to all of those, what has recently rekindled my interest, which occurred before I learned about the DC reboot, was my brother’s recommendation to check out Alan Moore’s run on Swamp Thing, from the 1980s. He assured me it was brilliant, that I’d love it, and since I consider my brother’s taste impeccable, I ordered a copy of the first volume. After reading the first two books in the trade paperback, I went: wow, this thing is massively wicked. I don’t want to spoil the surprise, but what makes Moore’s intervention in the series really fascinating is how it actually produces an amazing philosophical (ethical/ontological) quandary. Also appealing is its accessibility. The way they handle it, you don’t need to know anything about the series prior to Moore’s entrance (issue #21) in order to understand and enjoy it. The artwork by Stephen Bissette, Dan Day, and John Totleben glows. Like absolutely. And the story is both intellectually stimulating, beautifully rendered, and entertaining as hell. I intend to write something substantial about Moore’s Swamp Thing…it deserves the kind of attention Adam Jameson has given to Frank Miller’s Batman: The Dark Night Returns (as always, Jameson offers insightful and engaging commentary — if you haven’t read his stuff on Batman, you should check it out posthaste). So here I am. A true novice. At the moment, all I know is that I tend to gravitate toward comics that possess some combination of dark, strange, quirky, and unsettling aspects. Also, I’m excited to begin writing and thinking about this material, and equally excited to get more people involved in the conversation as well. (At present, I’m gearing up for doctoral exams, so this also serves as a much needed exercise in displaced anxiety.) Hopefully you’ll find it interesting.